Digital Service Management and its Contribution. This report highlights a toxic situation created by rubbish accumulating in the neighbourhoods, communities and housing estates of Gravesham between 2015 and 2017. Limited and rudimentary monitoring of a number of rubbish dumps was carried out over a period of approx one year. These dumps are labelled A to K on the map of the area shown above. Information has been compiled about the councils response to the situation and information about service improvements added by the author – a service management consultant with public sector experience in business change. Early on, an opportunity was taken to record the issues being raised by the borough councils customers and to feed them back to the council. The results of the above are published here in the form of a report pulling all the information together. This report was commissioned by citizens after a small number of them made their feelings about their street cleaning services known to the council. They were responding to two fly tipping incidents. Approx 2 tonne of rubbish was dumped on each occasion, blocking access and fouling the area. The response to the first incident was poor, and since then that experience has been repeated a number of times. This report is aimed to help these citizens to get their point across and engage with the service provider. They feel they had no voice in the matters being raised due to the poor response. The commissioners think the tasks undertaken to achieve this report are part and parcel of managing street cleaning and the routine work of responsible managers within the council. Street Cleaning should be viewed as a process containing a number of components. This report focuses on controlling and tasking the workforce. The commissioners think when the councils workforce is deployed to clean up after an incident of fly tipping its staff must be supervised by team leaders who have the objective of keeping their living spaces clean and improving their lives. If the above were true, what could possibly go wrong? The people of the community would be much more content, living in a clean area supported by their council, who achieve service excellence while they themselves are busy at work or enjoying retirement. There would be less complaints for the council to follow up. As a result of their experience people think that the street cleaning process is defective. (Whether this is due to cuts in council services, or not is a moot point and beyond the scope of this article.) Citizens expect clean streets, which they have no choice but to pay for. Nothing has changed there just because there was a recession. Value for money is therefore an issue. Service teams involved in the clean up of several lane blocking, fly tipping incidents took away only what was required on the day and turned a blind eye to other obvious rubbish only yards away. This was because it “wasn’t blocking the lane” or was “someone else’s responsibility”. A “blind eye” approach was observed on several occasions, notably 15th July 2016, see below. From the residents input it’s easy to see from a managers point of view how a different practice could be adopted, turning this service into one that earned the praise of its customers. The basic service required for the money, is one where responsibility is clearly defined and taken by the council for the state of the area. If rubbish is someone else’s responsibility, then the council must take the enforcement action. It cannot simply leave rubbish around, because it has been dumped “on someone else’s” property but must take action, so the effect (of a clean living space) is complete. (On a number of occasions while researching this topic, the author found a statement to the effect rubbish was not cleared by the council if it was in the alleyways, appearing on the councils new website. This is misleading information – the council owns the alleyways in this report.) The council as far as the commissioners know are responsible for all things to do with rubbish and the lanes are the same as streets – part of the town plan and require cleansing. The monitoring was confined to the two lanes, (marked in green), owned by Gravesham Council. These run for a few hundred meters, and provide access to the backs of seventy homes in: Bourne, Cruden and Freeman Roads and Medhurst Crescent, in the Westcourt Ward. The assumption is that these homes are occupied by approx one hundred and forty council tax payers yielding not less than £150K per annum in revenue, a portion of which is intended to pay for street cleaning. There are both short and long term dumps at intervals in the lanes. The root cause of this is examined below. Our first report drew attention to the issues and mapped the dumps. See here. 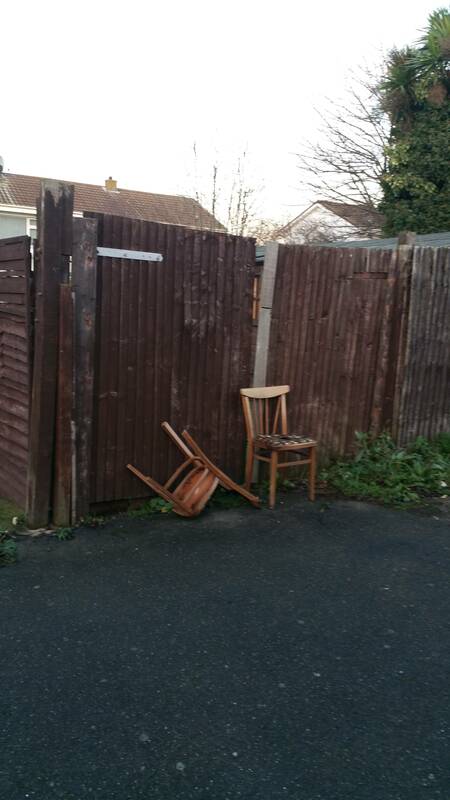 – 7th March 2016 Residents Report – Rubbish in Westcourt. It followed a visit by the council on 22nd February 2016. A dialog was opened after the meeting between the residents, housing department and also the current Councillor for the ward. This first report suggested how the issues could be mitigated, improving the user experience, but still resulted in no uptake of ownership of the problem. As a result of a conversation with Councillor Caller, it was decided the citizens could take a long view to appreciate the scale of the problem and attempt a more effective report or super complaint at a later date. The housing departments insistence that a change needed a petition was taken into account. The aim of this report is to drive a change. It is designed to be used in conjunction with a campaign posted at www.change.org. There has always been a few tonne of rubbish spread up and down these lanes, its been like that for years. The situation in the surrounding streets is slightly tidier, but they are similarly strewn with rubbish throughout the year and occasionally part cleared. The whole of the surrounding area therefore reflects that found hidden between the houses. The situation is self perpetuating – rubbish attracts more rubbish and this has a toxic effect on peoples lives, causing stress. Stress occurs when people have no power or control in matters that affect them. Also when they live in poorly maintained and squalid areas they think nobody cares, self esteem and morale are affected. The end effect of complaints is often disappointment and a feeling of “begging” for help etc. The householders are either working or retired families, neither of these groups need to come home to or live in squalid surroundings especially when they pay to support a workforce so they don’t have to. There is the regular presence of council vehicles and workers in the area assumed to be assigned to provide the service but these often simply drive by – as if it was in their brief to do so. See “blind eye” below. See area G later, for a good example of lingering rubbish dumped at Christmas and remaining in-situ into February while many bin collection days pass by. The situation in Gravesham makes parts of the town look like a third world country, this has a detrimental impact on the borough, especially when the entrances to the town on the A2 are litter strewn. This creates the impression citizens don’t care. But as we know Britain is one of the worlds steadiest and fastest growing economies according to the BBC. This raises the question how can it be so? Two types of dumping exist in the area. Short and Long term. 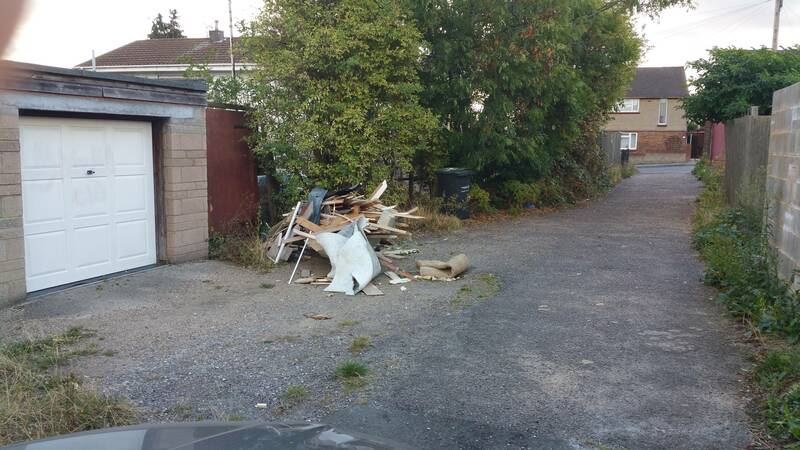 in the short term three or four fly-tipping incidents, starting in late 2015, were observed. These incidents lasted between 1 and 7 days in duration. The first was when a rogue trader attacked the area in November 2015, fly tipping a 2 tonne load comprised of the gutted remains of a kitchen and other building rubble. This was spread for about twenty yards between point C and D, and lay where it was dropped, blocking access to both cars and pedestrians for several days. It was eventually cleared by a five person team who took a morning to clear it. On 22nd February after another such incident, the people requested positive action from the council to keep the whole of the lane clear of rubbish and not just respond to fly tipping incidents. Several of the long term rubbish dumps in the lane were shown to the councils representative at a meeting in the lane. Residents made notes and emails (example here) were exchanged with the housing department and local Councillors were contacted with a view to establishing open dialog and action. A response was received from the Councillor for Westcourt, Mr Colin Caller. Nothing came back from the housing department. It was clear no action would result and another approach was needed. To begin monitoring, on the 9th of March 2016 an update was produced to the initial incident which contained photographs of the rubbish in the main dumping points. 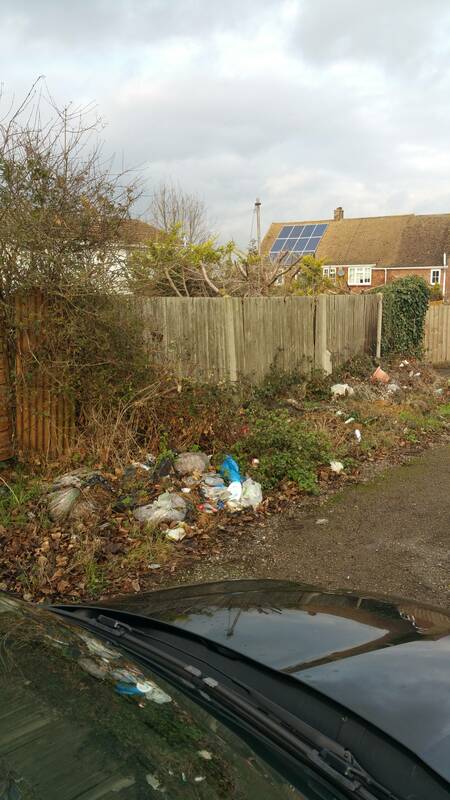 9th March 2016 Residents Report Update – Rubbish in Westcourt Post Council Visit. This established a baseline against which the long term nature of the problem could be demonstrated. The photo galleries in the final paragraphs of this report show snapshots of dumps over the ten months from 9th March, the 25th August, 24th October, 17th December, 8th & 17th January 2017. From the objects in the images, and the dates they were taken, the turn over at each point can be roughly gauged. You will see; some objects have been lying in the dumps for several months, while the main dumps at B, E and F have a long period of turn over, i.e are semi permanent in nature. Overall it can be seen the lanes are never clear and in fact always contains a quantity of mixed household bulky and loose waste on any given day. Metals are the only item with a short turn over. In summer the undergrowth masks the problem in places. NB. While this report covers a period of about a year, the situation has been the same for several years. The impact on the community is therefore lasting and sustained. The third fly tipping incident in this report, involved a tonne load of builders rubble tipped at point D on the 5th of December 2016. The conclusion was drawn that by now service costs are mounting. The commissioners could not understand why their council had withdrawn its very useful web reporting tool, Gravesham 24 (G24). This was taken out of service in April 2016 in favour of a new local reporting app’ which the council was designing and building (at an unspecified cost). A logical argument about this took place because G24 was low cost compared to its benefits which were high, plus it worked very well. It simply wasn’t marketed – according to a conversation with the councils head of digital services. The author offered to take part in testing the new app. He asked to be included in end to end testing (which tests the process on live reports and measures the actual service against the service agreement). This offer was not taken up by the council. Some time after the new system went live, a simple crude test was made by reporting three of the dumps between point D and G using the Gravesham Website. The result of this was that none of the three reports were acted on in the space of two months. See these reports Here. By comparison the user experience with G24 was often impressive. It was perceived dumping received attention within a few days and a service agreement of four days was implied. At the same time as Gravesham was divesting itself of G24, other councils in Great Britain were adopting commercial apps like G24. After requesting the business case for designing and building the new app, and not receiving it the conclusion was drawn that this was a costly retrograde step, robbing the council of an opportunity to improve services, while it took the online service down degrading the publics access to a reporting tool for a period. In the opinion of the author a truly great process would result providing a “Wow factor” if the right app (G24) were to be marketed and supported with an appropriate SLA (same or next day service). Since the redevelopment, another third party app for the smart phone called Littergram has appeared. This is aimed to provide all UK local councils with access to daily reports made by the public, to a single database. Provided as a “free” service. When littergram was tested by reporting a site in this area, It resulted in a tweet back telling the reporter to send the details again, this time via the councils website. Despite receiving a report the council did not take it up. No rubbish was removed as a result of the exchange. It could easily be concluded from this that the council has wasted more time and money on its own development and which has not yet developed sufficiently to be efficient or improve the situation. It is assumed there is a cost to the short term fly tipping incidents but finance and making a business case are beyond the scope of this report. ITV came up with a figure of £100 per tonne. Multiplied by the number of tonnes dumped in incidents in the town in the same period, preventative measures must be high on the financial savings agenda. In our area more than five incidents could have been avoided had the gates at point A and G been closed, making a saving, this would have the added benefit of earning the council the respect of citizens. The impact of long term dumping could have been part mitigated for several years and because of this an issue log was created from the views of the citizens who commissioned this report. See 7th March Report. Throughout the period many repeated requests for support have gone unheard. On 15th July a report was made via the councils complaints department that a council vehicle had collected rubbish from a short term site at point G, while ignoring the long term rubbish at points E and F – less than 15 meters away from it. Please note there was no response to this report. B. Easy to Dump. i.e provide straight runs which can be tipped without stopping. C. Unwatched. Except for a single domestic CCTV camera. D. Neglected. There is evidence of previous successful fly tipping attacks. The council who own it don’t maintain it. E. Un-monitored. By the street cleaning services or any other council service. F. Safe. I.e. the fly tipper can dump a load without being caught in the act and the likelihood of effective action against them appears to be low. According to this tweet on 9th January 2017 the council has successfully pioneered a relationship with a youth offending team to come up with a solution. Westcourt is one of many parts of the borough that would benefit from such a scheme being carried out. Our request for further information about how citizens could access this service went un-answered. In this area community life is poisoned by litter, rubbish and fly tipping and the attitude of workers to its citizens. A clean up along the lines offered by Community Payback is the desired result while simultaneously closing the area down to fly tippers. (Issue: If a contract goes to the community payback team its capacity would be an issue due to the volume of rubbish there is in the town, outside of its waste disposal facilities). Obtaining a response to complaints is difficult and access to services is varied or limited giving the impression costs are being avoided while taxes are collected. There is a school of thought that local services are being withdrawn or whittled away to private service providers. Value for money is an issue. Services are hard to get. Several tonnes of rubbish have had to be removed from this area, in more than three separate fly tipping incidents over the year – and at a cost. There are several tonnes of rubbish left behind. This attracts further incidents of fly tipping. The gates at A and G – a means of keeping costs down and keeping the area clean have been consistently disused without rhyme or reason. They cost several thousand pounds. In the five years since the gates were installed, council tax of £750K has been collected. In the area monitored the services in question are rated poor, and yet for a small change can be improved. When this happens both the community and the council will receive a boost. The commissioners think the council who owns the lane(s), should now: Review and repair the defective process, take steps to clear the lanes and secure them, and come up with an ongoing plan to manage the areas in question. If you have any questions about this article or require further reports – for example an expanded business case with innovative options, then the author can be contacted on 07703026329. Our Campaign Please follow the link and sign our petition.